← How Many Blockchain Identities Will We Have? Original post Oct 24 2016. Updated Nov 12 2016 with deployed contract and source code, and crowdfunding statistics. This is not advise as to whether Golem is a good investment or not. This is just a quick look at what Golem is offering and how they are doing it. Golem is going create the first decentralized global market for computing power combined with flexible tools for developers to distribute and monetize their software. The first transaction 0x0a75…be15 in block 2,607,801 at Nov-11-2016 03:12:28 PM +UTC. The last valid transaction 0xa8d9…2ea7 was for 0.85579574 ETH in block 2,607,934 at Nov-11-2016 03:41:36 PM +UTC. The crowdfunding was finalized in transaction 0x1bdf…e681 in block 2,607,939 at Nov-11-2016 03:43:05 PM +UTC. The crowdfunding raised 820,000 ETH (~ USD 8,620,660) within 30 minutes and 37 seconds from commencement, with 522 addresses and 647 events. 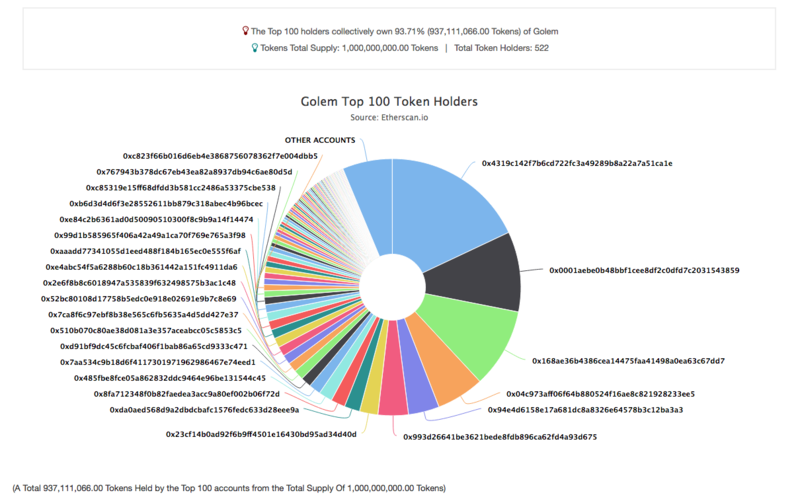 Nov 12 2016 – The Golem Token Sale: Irrational Exuberance? Oct 17 2016 – Golem development team: So Who The Heck Are We, Anyway? Following is the source code deployed to the Ethereum blockchain at address 0xa74476443119a942de498590fe1f2454d7d4ac0d. To participate in the crowdfunding, you will have to send the data field “0xefc81a8c” with your ether transaction to 0xa74476443119a942de498590fe1f2454d7d4ac0d. This calls the create() method (web3.sha3("create()").substring(0,10)="0xefc81a8c"). Gas needs to be set to at least 70,000. Crowdfunding starts ~ 15:00 Nov 11 2016 UTC or 02:00 Nov 12 2016 AEST. Note that the contract below does not implement the ERC20 functions transferFrom(...) and approve(...). uint8 public constant decimals = 18; // 18 decimal places, the same as ETH. // The funding cap in weis. // The flag indicates if the GNT contract is in Funding state. // Receives ETH and its own GNT endowment. // Has control over token migration to next version of token. // The current total token supply. /// `msg.sender` to provided account address `_to`. /// @notice This function is disabled during the funding. // Abort if not in Operational state. /// @notice Migrate tokens to the new token contract. // Abort if not in Operational Migration state. // Abort if not in Operational Normal state. /// @notice Create tokens when funding is active. // Abort if not in Funding Active state. // Do not allow creating 0 or more than the cap tokens. /// transfer ETH to the Golem Factory address. // Abort if not in Funding Success state. // Switch to Operational state. This is the only place this can happen. // the 18% of total number of tokens. // GNTAllocation contract which will not allow using them for 6 months. // Transfer ETH to the Golem Factory address. /// has not reached the minimum level. // Abort if not in Funding Failure state. // developers by numbers specified in `allocations` table. // Addresses of developer and the Golem Factory to allocations mapping. allocations[_golemFactory] = 20000; // 12/18 pp of 30000 allocations. allocations[0x9d3F257827B17161a098d380822fa2614FF540c8] = 2500; // 25.0% of developers' allocations (10000). allocations[0xd7406E50b73972Fa4aa533a881af68B623Ba3F66] = 730; // 7.3% of developers' allocations. allocations[0xB127FC62dE6ca30aAc9D551591daEDdeBB2eFD7A] = 630; // 6.3% of developers' allocations. allocations[0x5E455624372FE11b39464e93d41D1F6578c3D9f6] = 310; // 3.1% of developers' allocations. allocations[0xB7c7EaD515Ca275d53e30B39D8EBEdb3F19dA244] = 138; // 1.38% of developers' allocations. allocations[0xD513b1c3fe31F3Fe0b1E42aa8F55e903F19f1730] = 135; // 1.35% of developers' allocations. allocations[0x70cac7f8E404EEFce6526823452e428b5Ab09b00] = 100; // 1.0% of developers' allocations. allocations[0xFB6D91E69CD7990651f26a3aa9f8d5a89159fC92] = 70; // 0.7% of developers' allocations. allocations[0x657013005e5cFAF76f75d03b465cE085d402469A] = 42; // 0.42% of developers' allocations. allocations[0xD0AF9f75EA618163944585bF56aCA98204d0AB66] = 25; // 0.25% of developers' allocations. /// from GNTAllocation to developer's address. // During first unlock attempt fetch total number of locked tokens. // Will fail if allocation (and therefore toTransfer) is 0. Crowdfunding source code from https://github.com/imapp-pl/golem-crowdfunding at Oct 28 2016 14:57:36 UTC. Still to be audited. // The flag indicates if the GNT contract is in "funding" mode. // The currect total token supply. // Checks if in Funding Active state. Aborts transaction otherwise. // Checks if in Funding Failure state. Aborts transaction otherwise. // Checks if in Funding Success state. Aborts transaction otherwise. // Checks if in Operational state. Aborts transaction otherwise. // Checks if in Operational Normal state. Aborts transaction otherwise. // Checks if in Operational Migration state. Aborts transaction otherwise. // Helper function to get number of tokens left during the funding. // Creates additional 12% of tokens for the Factory and 6% for developers. // TODO: SET before THE CROWDFUNDING! // List of developer addresses and their shares. // The sum of shares is 10000. This entry was posted in Blog and tagged Crowdfunding, Ethereum, Golem, Smart Contract, Source Code. Bookmark the permalink.